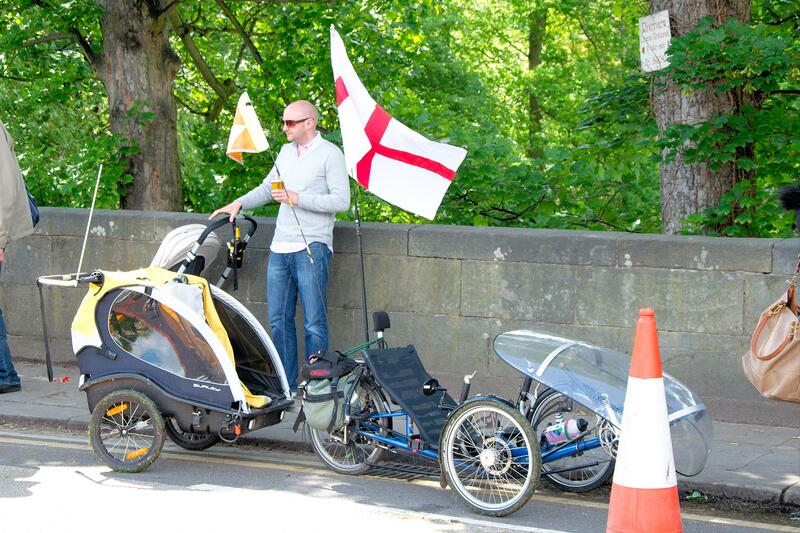 The Bed Race proved a good test of the Trike Antenna. This is a mobile half wave 2m/70cm antenna mounted on a copper pipe. It was originally made as a rucksack antenna for a large fell race duty. The rucksack now has a smaller antenna which fits better under trees. I was able to listen to RAYNET control and some of the foot patrols as I cycled from Harrogate. Contact was very easy on 1W using the VX-7. On the way home I contacted M0MCI at Harrogate Conference Centre from Boggs Lane, 1W transmit, his signal with me just dropping to readability R4. The Bed Race covers a relatively small area, but it has challenges for radio with part of the race following a deep winding valley. Control is in this valley at the start and finish of the race and has a large mast. Contact with control is possible through the entire course using handheld radio, but needs good large antennas at the more distant points. Stations cannot always hear each other, but that is not needed with a good Control. The trike would be a great vehicle for an event like the Midnight Walk at the end of this month. I expect I’ll be with St John for that event, so on foot on a different radio network. This entry was posted in RAYNET. Bookmark the permalink.